Ready for a great getaway in the Smoky Mountains? Simply reserve one of our cabins in Pigeon Forge with fire pits! Our cabins with outdoor fire pits are perfect for the vacationer who loves to spend time in nature. Whether you want to spend time with family and friends around the campfire or just roast some s'mores underneath a starry night's sky, our cabins with this amenity are ideal for your trip. Even on a cool night in the mountains, an outdoor fire pit can put off plenty of heat so you can enjoy a nice night by the fireside with the people who matter most. Best of all, you can reserve your own Pigeon Forge cabin with an outdoor fire pit today and you'll earn a 15% discount on your nightly rate! Simply check our availability online or contact our helpful reservations office to see how much you can save on your Smoky Mountain getaway! "Knotty and Nice" offers couples a honeymoon cabin in Pigeon Forge which offers a hot tub, gas fireplace, and more! This romantic 1 bedroom cabin boasts a beautiful riverside location, a hot tub, screened-in deck, and room for two guests in the Smoky Mountains of Tennessee! 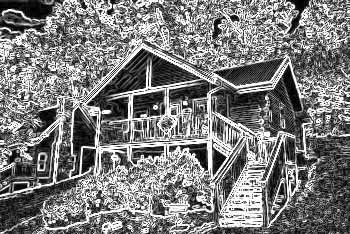 Enjoy a Smoky Mountain cabin with lake access and a dock when you book Ivey's Cove in Sevierville, TN with Cabins USA! Save 15% on your rate! Get away from it all when you book "River House," an affordable 2 bedroom cabin with a riverside location, a hot tub, river views, and a pool table! Embark on a relaxing mountain adventure at "Bear Cove Escape", a private 3-bedroom cabin near Pigeon Forge that offers guests a hot tub, fireplace, pool table, and other cabin amenities.